Dies R Us: Boo to You! Can you feel that touch of fall in the air yet where you live? That means it won't be long until Halloween and we will need to start thinking about all those cute Halloween cards we need to make! If you LOVE Halloween like I do, you may already have tons of Halloween stamps and dies. 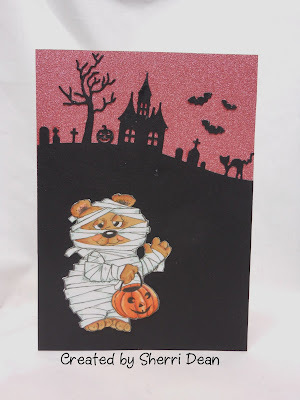 If you are relatively new to using dies, your selection may be more limited, but don't think that means you can't create an awesome Halloween card! Using only one die, I came up with this cutie! The die I chose was Impression Obsession Halloween Hill and the cute "mummy" is a QKR Stampede digi. The possibilities with this die are unlimited! It just makes such a perfect spooky background for whatever you want to add. Be sure you check out the Dies R Us Challenge Blog! There is still time to join in on the latest challenge and possibly win a gift voucher to the fantastic Dies R Us Store! Enjoy the rest of your week and I'll see you here again next Wednesday!